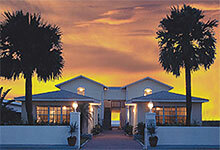 We list and link EVERY lodging provider in Redington Beaches that we know of. Like this page ?? 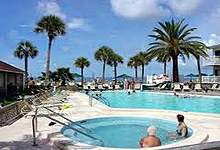 Visit Beachdirectory.Com for even more detailed information about Redington Beaches. 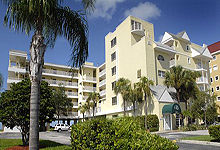 We offer 1 & 2 bedroom apartments, as well as efficiencies and motel rooms. 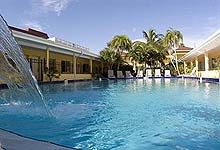 Enjoy our 20´x40´ heated swimming pool and our 200 feet of beachfront - the largest in the area. Look for the special Internet discount on our site. Private balconies overlook the beach and the Gulf of Mexico. These individually decorated apartments are fully furnished with well-equipped kitchens, including microwave oven and icemakers. If it's action you want, Redington Long Pier provides fishing opportunities and nearby John’s Pass and restaurants provides local flavor of the Gulf and shopping opportunities for all. Boat slips directly on the intracoastal, huge new townhomes !! Docks and boat slips are always available in the back yard. Steps away across the street is the aqua beach water bordered by white sand. Dine in multiple restaurants or be a chef in the upscale, fully furnished kitchen and entertain your guests. These are 3774 square foot townhouses with 3 bedrooms, a den ("4th bedroom") and 3 baths. These units sleep 8-10 people each and we have 6 units like this. The Carousel Motel is located in the beautiful and quiet area of Redington Shores on the Gulf of Mexico in sunny Florida, just 35 min. from Tampa airport. All of our units include a 27" TV with VCR & cable TV. DVD players are also in every unit. Current & classic videos & DVDs are available free at the front desk, with plenty of choices for all ages. Telephone (with messaging service & data modem plug), hair dryers. and irons and ironing boards are included in all units. Reserve your spot on the sand now at the Doubletree Beach Resort! 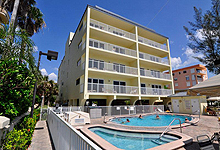 Centrally located between Clearwater and St. Pete Beaches. Directly on the Beach and Gulf of Mexico. 125 Spacious NEW Guestrooms with Private Furnished Balcony. Private Beach and Beachfront Pool. Mangos Restaurant with open air gulffront Verandah and Beachside Tiki Bar featuring Live Entertainment. Friendly, Fun Hospitality and Warm Chocolate Chip Cookies! Picture yourself enjoying this spectacular sunset ! Fully furnished condos, all with private balconies overlooking the beach, provide spectacular sunsets and all you need for a quiet, relaxing vacation. Amenities include well-equipped kitchens, including microwave ovens, and icemakers, heated pool, and private security entrance. 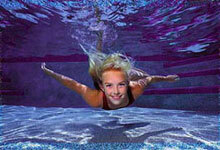 Our units are spacious condos filled with features and fun things to do. 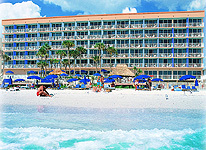 And our beachfront property offers fantastic rates, like efficiencies from $350 per week or $65 per day. cable TV, everything for cooking in or out, heated pool and 16-foot jacuzzi, weekly maid service, and much more. We have a fleet of of sailboats and catamarans. Efficiency units, 1-BR and 2-BR apartments. RCI members discount available. 40 air-conditioned rooms with kitchenettes, refrigerators, microwaves, coffee/tea makers, Large flat-screen TV:s ceiling and much more. Housekeeping is provided daily. We also have a picnic area, barbecue grills and hammocks on the beach. Relax at Hotel Sol! Our 32 rooms are full-efficiencies with daily maid service provided. Enjoy the splendors of the beach right across the street or enjoy the amenities on our property, such a our tennis court, the pool, our barbecue grill and much more. FREE continental breakfast included. If you have dreamed of spending lazy days with palm trees and white sandy beaches, basking in the sun, and splashing in the Gulf of Mexico, the Islander is the place for you. JC Resorts offers luxury rentals in Ram Sea, Sand Dollar, Emerald Isle, Hamilton House, Sea Oats, Angler's Cove and several other beachfront properties along the Redington beaches. We also have properties in Madeira Beach, Indian Shores and Indian Rocks Beach. One visit to our informative website and you will know you have arrived at the right place. 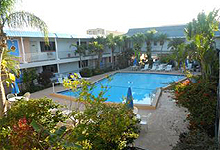 The value minded tourist will quickly appreciate that the economically priced, pet friendly Malibu Resort, with a great selection of clean, large, modern units, friendly atmosphere, beautiful Key West heated pool setting, convenient on-site restaurant, and amenities often unmatched by its larger competitors, offers an outstanding vacation value. Shimmering, blue-green water. A gentle sea breeze rustling the palm fronds. Miles of white, sandy beaches. The sunset vividly painting a different masterpiece every day. 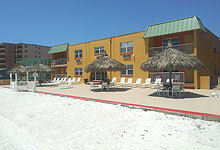 All this and more is waiting for you at the Monterey Condominium Motel on Redington Shores Beach, Florida! Since the 1940's, these Mediterranean-style bungalows have resided on their own beautifully landscaped courtyard called Park Circle. Jewel-toned windows set the stage for a relaxed, colorful stay. Each bungalow has been lovingly restored with antiques and wooden floors and are reminiscent of times gone by. With added modern features such as central heat & air conditioning, microwaves, direct dial telephones, cable TV and FREE wireless internet access, each bungalow is fully furnished with everything you will need. All Gulf Front condominiums with private balconies conveniently located to shopping, sailing, fishing and family fun! Relax in the heated pool and Jacuzzi. Two barbecue picnic areas for your "outdoor speciality". Enjoy the shade of our Tiki areas or take a leisurely stroll on our beautiful beach. AAA approved. Free high speed internet access. Enjoy nature's gifts of white, sandy beaches, and beautiful sunsets, while staying in one of our individually decorated kitchen equipped units. Newly renovated in 2006, the Royal Orleans by Sirata truly captures the quaint setting of old New Orleans; the rustic courtyard and the beautiful landscaping provide the perfect setting for a relaxing day by the pool. The beautiful shores of Redington Beach are just steps away, the white sand and inviting emerald blue water is always a pleasure to experience. Well-kept motel located directly on the water! Directly on Boca Ciega Bay in nearby Redington Shores, directly opposite the Long Fishing Pier and with public access to our beautiful beaches. Gorgeous heated waterfront pool, private boat dock and fishing dock with BBQ area. Pet-friendly and offering superior service at economical rates. Huge private balconies directly on the Gulf !! Many repeat guests! 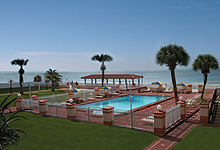 Four 2-BR/2-BA units directly on the beach on the Gulf of Mexico. WIDE beach, quiet setting. Full kitchens, full laundry room in each unit, professionally decorated, privately owned. Small heated pool and jacuzzi, barbecue and picnic area. All units completely non-smoking. Detailed website!